Here it is!!! The month of June has arrived!! And with it, the hurricane season! Every year the hurricane season starts on the 1st of June until the end of October! (This year was an exception as the hurricane season was brought forward on the 13th of May 2012- cf: hurricane season brought forward! ). What does it mean? It simply means that tropical storms and hurricanes may appear!! Since 2000, the hurricanes starting with “I” have been particularly strong and destructive for the Caribbean Islands. For Mexico, the letter “W” has been a bad omen. I let you remember Wilma in 2005… The biggest, largest and longest hurricane ever recorded in the Atlantic! 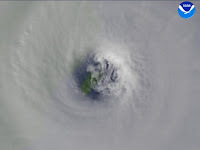 According to the National Oceanic and Atmospheric Administration, Wilma was the 22nd storm, the 12th hurricane and the 6th major hurricane and the 3rd Category 5 hurricane of the year 2005! Its width was almost covering the whole Caribbean Sea! Plus, a hurricane usually stays a few hours in a same place before moving forward. Wilma stayed THREE ENTIRE DAYS in Cozumel’s island (located in front of Playa Del Carmen)!!! Can you imagine?? THREE ENTIRE DAYS!!!! Time should have been long during this hurricane! Even if 2012 should be calmer than 2005 according to the scientific forecasts, stay alert and be prepared! American-development is here to advice you! G20 has started today in Mexico!! The first arms transplant in Mexico: A success!